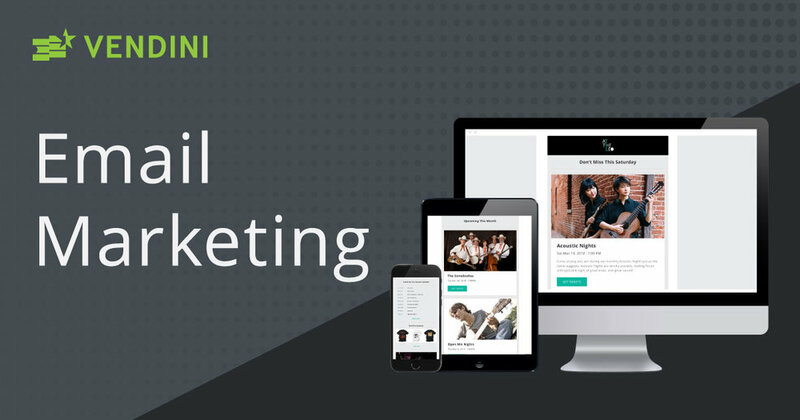 Part of Vendini’s all-in-one ticketing & event management solution is Email Marketing Manager, a cool little application that lets users create enticing email campaigns that help drive ticket sales, donations and memberships. 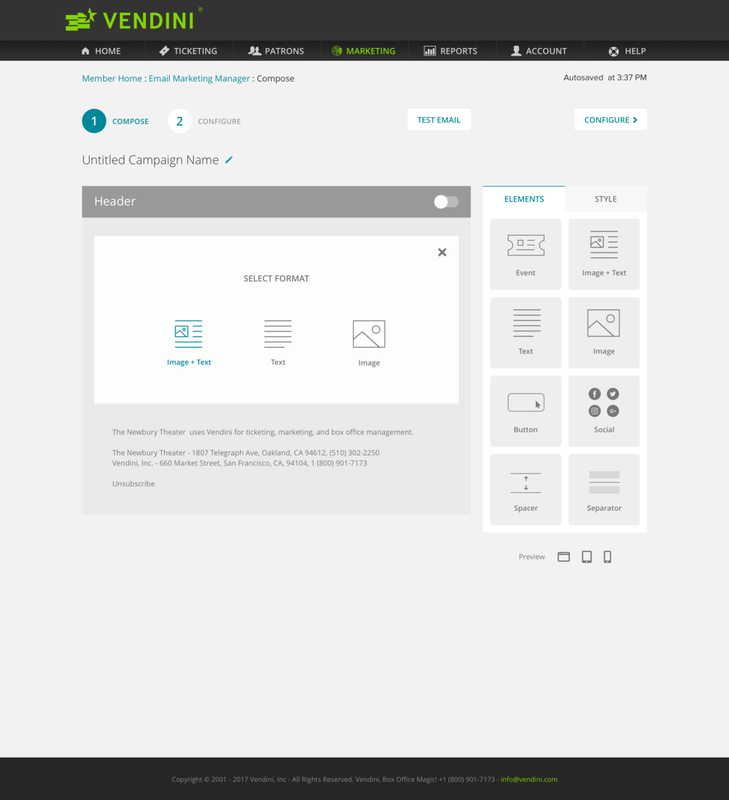 With Email Marketing Manager, users can create email campaigns in minutes, simply by selecting the events they want to promote and dropping them into the email. Like many of the projects I worked on during my time at Vendini, with Email Marketing Manager, our goal was to take an existing product that hadn’t been touched in years and turn it into something new and exciting. Perhaps the greatest thing about Vendini’s event management system was that once an event was created the data for that event could be easily recreated anywhere else. This meant promoting an event or series of events in an email campaign could in theory be as easy as selecting an event and dropping it into an email, just like a mailchimp block; only here, the block would be pre-populated with marketing creatives, event info, dates/times, and a call-to-action. If I had to choose a favorite project during my time at Vendini, this would definitely be the one. The Email Marketing team was awesome, my Product Manager was sharp as they come and had lots of great ideas, and we ended up shipping a really cool product. As Lead Product Designer on this test, I was responsible for all aspects of the design from wireframe to prototype. I also ran usability tests, coordinated constraints and versioning with the tech team, and managed the UI Kit. Design streamlined workflow for event and audience selection. Design formatting and styling apparatus. 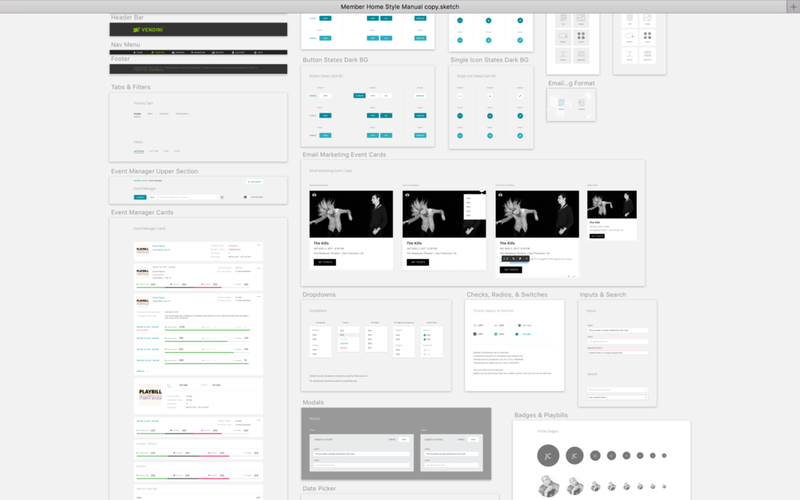 Design dashboard for campaign management and performance tracking. Ensure stub sites checkout is in step with individual venue site checkout. Emails must be responsive, and responsiveness must accommodate user generated content. Event blocks must accommodate instances of single and/or multiple performances. Users must be able to customize content and style, but their ability to create poor emails must be contained. Look and feel must be consistent with the rest of Vendini’s event management suite. The "Elements" tab is the most important component of this application. 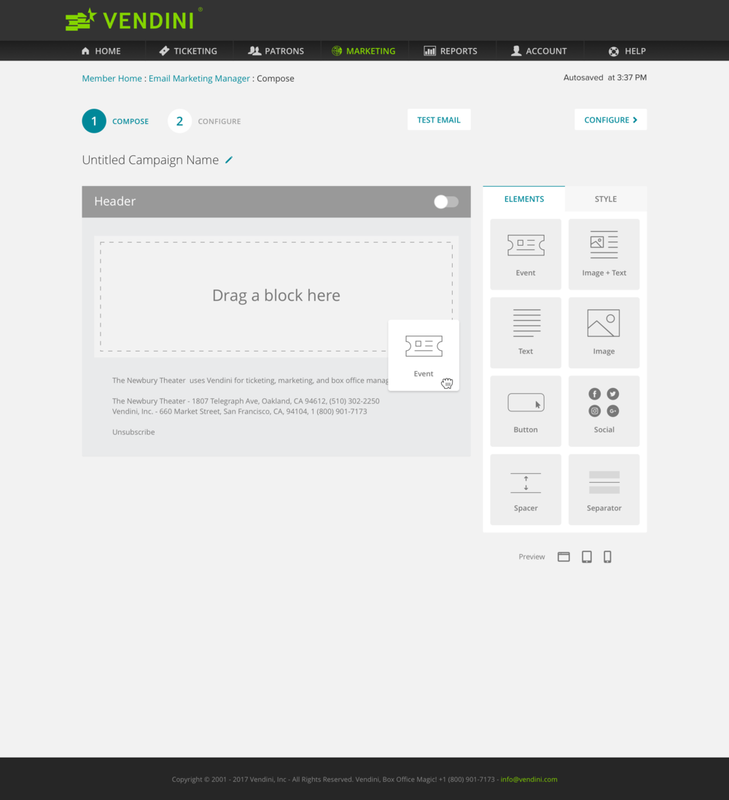 Early on in this project, we got it into our heads that users should drag "image + text" blocks from the Elements menu into the email, then attach events (or whatever else) to them. Seemed like a good idea at the time, but also for lack of a better word... off. Then one day it hit me. I thought to myself, "This is not right!" It's the event that matters. That's what the user is looking for. Put an event block in the menu, and let users choose the format in which that event is rendered. You can see the difference (among other differences) in the iterations below. Email Marketing Manager was part of a larger application suite called Vendini Member Home. With Vendini Member Home, performance venues can essentially manage every aspect of their business. As the fine folks at Google may tell you, one of the biggest challenges of working with any large application suite is designing a consistent look and feel that reinforces the brand and has with it a set of best practices for every component. 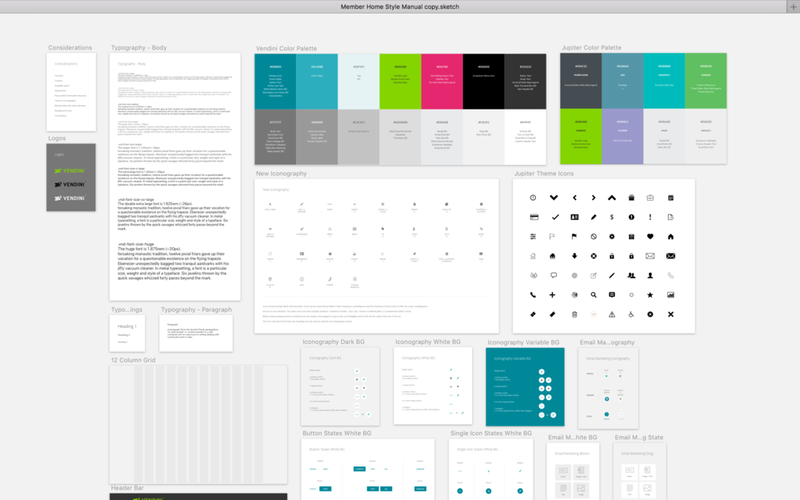 As I put together this document, our Technical Designer took what I did here and put it into a Living Style Guide that looks a lot like what you would see from the Bootstrap and Google Material guides.